The OpenType improvements alone are worth the upgrade. InDesign CC 2017 is Adobe’s first full version number upgrade since InDesign CC 2015 three years ago. The improvements will be welcomed by users who use advanced OpenType fonts, use a Retina display, create footnotes, or open documents from a networked file server. 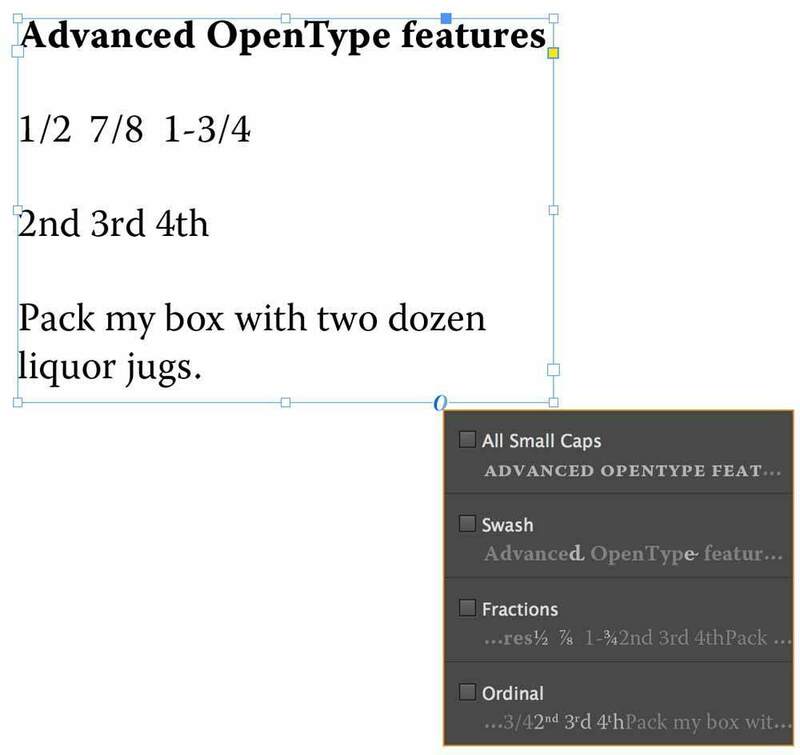 To access advanced OpenType features such as alternate characters, fractions and stylistic sets, all you have to do is click on the tiny O badge that appears below a selected text frame or selected text. Here’s how it works. One character: To see alternates for a selected character, select only that character. Hover over the selected character to see its alternates appear below the character. Click on an alternate to apply it. The letter A in the Adios Pro advanced OpenType font has several alternate glyphs. Fractions and Ordinals: To change the format of a typed fraction such as 3/4 or 5/8 to a true fraction, select the typed fraction and click on the O badge. Its true fractional form will display and you can click it to apply it. Use the same technique for ordinals such as 2nd, 3rd and 4th. Selected text: To see alternates for a selection of text, select the text. Click the O badge to see that text with various combinations of alternates. Click on any combination of alternates to apply them. The Warnock Pro OpenType font has an alternate swash glyph for the “d” in the selected text. It can also apply true small caps to the selection. Selected text frame: To see all the alternate options for the text in an entire text frame, select the text frame and click on the O badge. Click on any combination of alternates to apply them. These are the advanced OpenType options for the text in the Warnock Pro font used in this text frame. 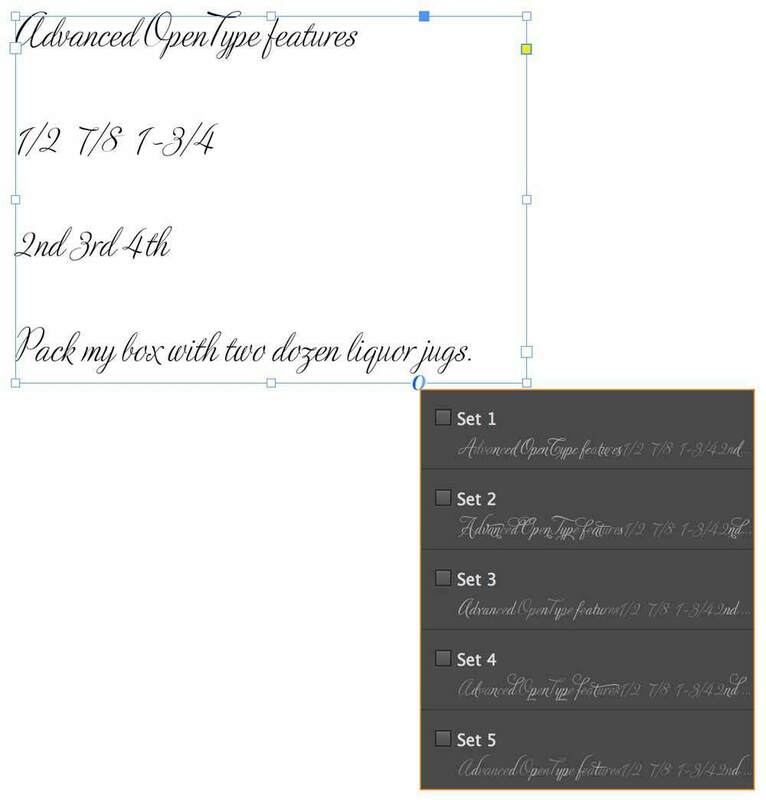 InDesign helpfully shows previews of some of the alternate glyphs. Stylistic Sets: Font designers often create pleasing combinations of alternates for you and collect them into what’s known as a stylistic set. To see the stylistic sets available for all the text in a selected text frame, click on the O badge at the bottom of the text frame. (If the designer assigned names to the sets, those names will appear; otherwise, the sets are simply numbered.) To apply a stylistic set, choose it from the list that displays. 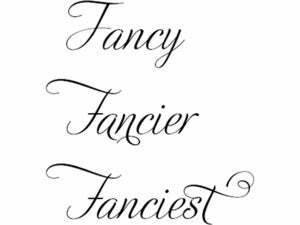 These are the advanced OpenType stylistic sets available for the text in the Adios Pro font used in this text frame. InDesign helpfully shows previews of some of the alternate glyphs. 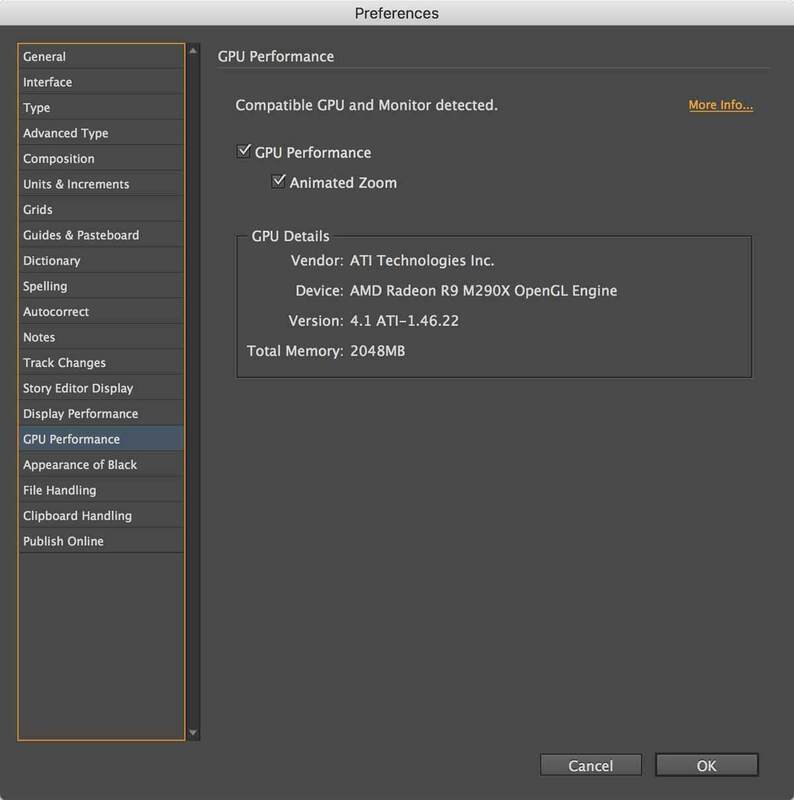 If your system meets these requirements, InDesign renders your document using the GPU instead of the CPU and sets the Display Performance to High Quality. To enable and disable this feature, click the rocket icon at the top of InDesign CC 2017’s Options bar shown in the following screen shot. Hover over the GPU Performance icon in InDesign’s Options bar (circled) to see the status of this feature. Click it to open the GPU Performance preferences window. When you click the rocket icon, InDesign displays the GPU Performance preferences window shown. InDesign’s GPU Performance Preferences window lets you control how the GPU Performance feature works, see your computer’s graphics card, and learn more about this feature at Adobe’s website (circled). In my testing with GPU Performance enabled, graphics of all file types displayed more clearly than they did with GPU Performance disabled. Panning and zooming was also smoother. However, PNG files were slightly jagged compared with the same files viewed in QuarkXPress 10 or higher, as were rotated PSD and TIF files. In previous versions of InDesign, if you opened a document stored on a network server rather than from your computer’s hard drive and then you disconnected from the network for any reason, InDesign would crash. Now InDesign caches your document to your local drive so that you can work with the document even if the network crashes. When the network comes back, InDesign invisibly reconnects to it. If the network doesn’t come back, you can save your document to your local drive. In previous versions of InDesign, if you inserted a multi-column spanning headline in a multi-column text frame, footnotes from text above the headline would appear immediately above the headline instead of at the bottom of the column of text. In version 2017, you can force those footnotes to appear at the bottom of the column. To change this setting for an entire document, choose Type > Document Footnote Options. To apply this setting to only the selected text frame instead of the entire document, choose Object > Text Frame Options > Footnotes > Enable overrides (span or not). Besides the updated features described above, this upgrade uses a new document file format that can only be read by users of version 2017 or higher. However, this shouldn’t be a big issue for most users because Adobe’s subscription model allows subscribers to download the most current version any time. To share 2017 documents with users of InDesign CS4 through 2015, a 2017 user can choose File > Save a Copy and then choose “InDesign CS4 or later” from the Format menu. This saves a copy of the document in IDML format. While the improved features are limited in scope, InDesign users will appreciate this upgrade if your documents use footnotes or you open documents from a networked file server. If you have a Retina display, you’ll enjoy the far better graphics previews. 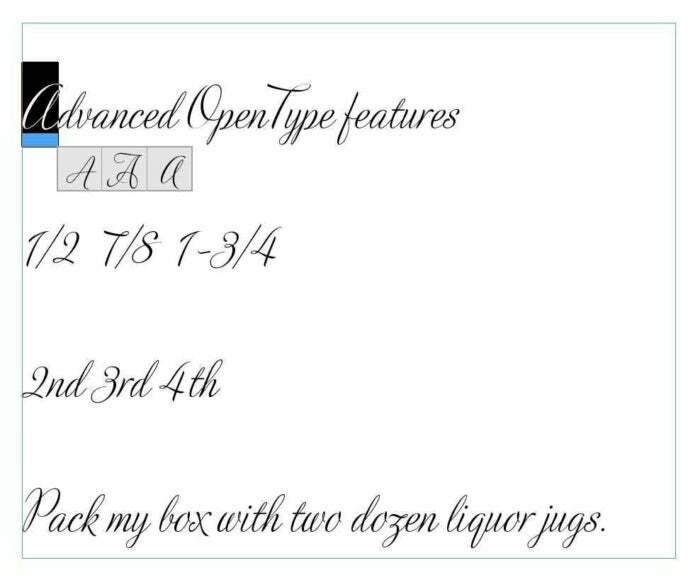 And all users will enjoy exploring the long-hidden advanced features of some OpenType fonts. Abobe InDesign CC 2017 is $20 per month. Adobe also offer access to all of its Creative Cloud apps for $50 per month, or $80 per month including access to Adobe Stock images.